"What gets measured gets managed" is an adage, and it's true. If you're in debt, one of the best ways to motivate yourself to get out of debt is by tracking it. Debt tracking websites and apps allow you to create debt payoff plans, calculate how much interest you'll pay in the process of becoming debt-free, and predict the all-holy debt-free date. Many even let you play around to see what the effect of extra monthly payments are. There are a ton of free debt tracking tools, but which one is right for you? As a debt blogger, I've spent three years trying and reading extensively about various tools, and have come up with a list of five that I think are best. Undebt.it undoubtedly has the most features of any debt tracker out there. It's the Cadillac of debt-payoff trackers. This comes in especially handy for student loans and credit cards, many of which have helpful (but complicated) repayment schemes and promotional offers. It even supports the debt snowflake method of making small, extra payments as you're able. And you can switch among all these plans whenever you want. The only downside of Undebt.it is that it's a bit clunky until you get used to it. The full suite of free features is nice, but it does take a bit of time navigating the website to understand all the ins and outs. If Undebt.it seems too confusing, try Unbury.me. Its simple block-style layout is pleasing to the eye, and entering debts is a snap. 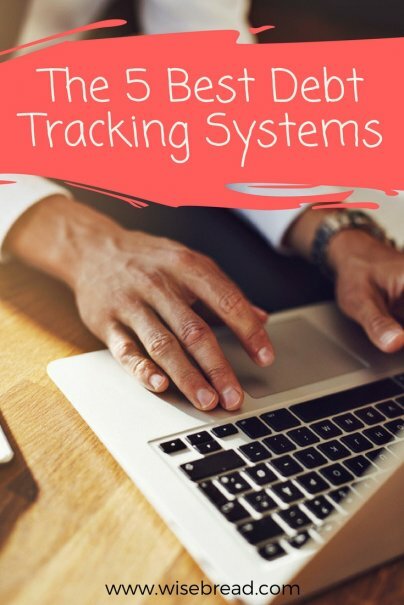 It's almost too simple, which is why this debt tracker works best if your debts are relatively straightforward with no confusing, shifting APRs or payment schemes. Just remember to sign up for a free account after you enter your debt information to save your work, or it'll all be lost as soon as you leave the page! You might be familiar with the popular budgeting software Mint, but did you know you can use it to track your debt as well? Using its Goals function, click on "Pay Off Loans" or "Pay Off Credit Card Debt." It'll automatically populate the screen with your loans or your credit cards, and ask you to input any missing information about your interest rates and minimum monthly payments. By sliding the payment toggle, you can instantly see how much interest you'll save by raising or lowering your monthly payment amount, along with how long it'll take you to get out of debt. Select your payment amount, and follow Mint's instructions on where to send the extra payments. The beauty of the Mint system is that it updates automatically, meaning you don't have to login and update your account every time you make a payment. Plus, you get all of Mint's extra budgeting tools. The Debt Payoff Assistant app is the most basic, no-frills debt payoff tracker. It comes with three payoff plans to choose from: lowest balance first, highest balance first, and highest interest first. You can also come up with a custom plan if none of these work for you. Debt Payoff Assistant doesn't really offer much in the way of visualization except for a pie chart that shows you what kinds of loans make up your total debt. If you really want a graph of your debt over time, try Undebt.it or Unbury.me. If your debt payoff scheme confuses you, consider going with the Debt Payoff Planner Calculator app. The strength of this app is that it shows you exactly how much money to send to each debt every month, with the amounts changing as you pay off certain debts. You can choose from three payoff plans: the debt snowball plan, the debt avalanche plan, or a custom plan. Again, this app doesn't really show you a great visualization of your debt payoff progress. Choose another debt payoff tracker if that's important to you. If you're not sure which tracker is right for you, choose a couple to try out for a month or two. The idea is to help you get clearer about what you owe, the best way to pay it off, and to help you stay motivated until your balances are cleared.